Welcome to Ohio’s Favorite Fish Farm! You’ve arrived at Ohio’s largest indoor fish hatchery, a center of aquaculture innovation by a family of pioneers with over 30 years of experience. Freshwater Farms of Ohio is the largest indoor fish hatchery in the state of Ohio and the home of the Ohio Fish & Shrimp Festival. We’ve been welcoming visitors to our farm for over 30 years. Exploring our farm is fun for all ages and completely free. While you’re here, visit our Sturgeon Petting Zoo to get up close and personal with rare, endangered fish. Participate in a Trout Feeding Frenzy and watch them splash in excitement as you feed them by hand. We have a large variety of Fish & Critter Displays in the hatchery and at our retail store. We are the only producer of fresh trout products in Ohio. Visit our retail store to purchase fresh, frozen and smoked trout fillets, trout patties, smoked trout spreads and other Ohio foods. Take home custom-made pottery and garden decor created by local artists. We offer expert advice on recreational pond and water garden setup and maintenance concepts. Browse our large variety of supplies including stocking fish, fish feed, pond fountains, aerators and much more! We invite you and your family to tour the largest indoor hatchery in Ohio. Come get up close and personal with rare, endangered fish at our sturgeon petting zoo. Watch the trout jump for joy and splash in excitement as you feed them by hand in the Trout Feeding Frenzy. 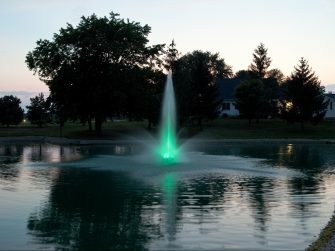 Find everything you need to setup and manage your own pond or water garden including advice from the experts, decorative fountains and lighting systems, pond aeration systems, pond pumps, DIY fittings, netting, tubing, filtration components, stocking fish, fish feeds and more. Take home the freshest fish in Ohio! Get fresh, smoked and frozen trout fillets, seasoned trout patties, our popular smoked trout spreads and other Dr. Dave approved seafood. We visited for the Freshwater Fish & Shrimp Festival. My boyfriend and I had a day off work together and we thought, "Why not? Let's check this shindig out!" We weren't expecting a whole lot, but it was actually quite fun. Plenty of food stands serving up seafood, live bands jamming out, and a few crafting stations. 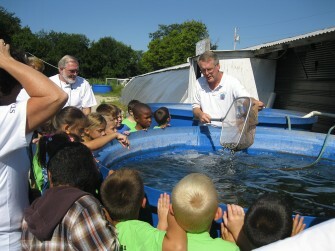 You can also head out back and learn about the freshwater fish and shrimp! We had a wonderful time and ate lots of yummy food. We are looking forward to the next festival! So I show rabbits at fair and I went into the auction selling my show rabbit and having them but it for a petting zoo. Thinking hey this might be a good idea it's not. He's a show rabbit not a pet. I'm very disappointed in Dave. He should've done research on how these rabbits are taking care of before going into this. I've been checking on him and they didn't have dry food they had the food I gave them and it was wet but the ducks next to them had food. I was expecting better but it turns out it was worst than I could've ever expected and now my rabbit is acting sick and I'm probably going to have to say goodbye to him and I'm EXTREMELY disappointed in them for not researching, or taking care of them. They all are probably going to die soon and i can't express how disappointed I am in them.